Many women would like to lose a few pounds, but if you'd like to put on pounds instead, you may find it to be a challenge. To gain weight, you'll need to increase your calories, and if you have a small appetite, you may want to try some other ways to boost your intake, in addition to your regular meals and snacks. There are a few supplements you can include in your diet to help you bulk up. You likely want to gain lean muscle rather than fat. Studies have shown that whey protein -- which comes from milk -- increases muscle growth when consumed before or after a workout. One study published in the "International Journal of Sports Nutrition and Exercise Metabolism" found that supplementing with whey protein significantly increased lean muscle mass and strength. The high quality protein in whey contains all of the essential amino acids, including leucine, a growth-promoting amino acid. Compared to other supplements on the market, whey protein is easy on the wallet and is available at most supermarkets and drug stores. One serving of whey protein contains between 25 and 50 grams of protein, which provides 100 to 200 calories. The Academy of Nutrition and Dietetics recommends adding 300 to 500 calories per day to your diet to gain weight. You can get 425 calories and 26 grams of protein by drinking a daily smoothie made from a cup of whole milk, a medium banana, a tablespoon of peanut butter and a scoop of whey protein. Keep in mind that whey protein comes from milk, so if you have a milk allergy or are lactose intolerant, this supplement may not be appropriate for you. Boost your water intake when adding a protein supplement, because protein metabolism requires extra fluid. If you need to gain weight but your appetite isn't big enough to add extra food to your diet, dry milk powder might be a good supplement for you. You can purchase a nonfat version or a full-fat version that's higher in calories. According to Today's Dietitian, you need to consume a balance of protein, carbohydrates and fat to gain weight the healthy way. Whole powered milk contains a balance of all three of these nutrients, weighing in at 320 calories, 17 grams of protein, 25 grams of carbohydrate and 17 grams of fat per 1/2 cup. The nonfat version contains 220 calories, 22 grams of protein, 31 grams of carbohydrate and 0.5 gram of fat per 1/2 cup. Dry milk powder can be blended into foods you already consume. Stir the powder into soups, oatmeal, smoothies, mashed potatoes and casseroles. To avoid a clumpy texture, add the powder before you heat the food. Creatine is a common weight gain supplement used by athletes. Muscles contain creatine, a natural substance that draws water in and helps generate energy for muscle contraction. One small study published in Medicine and Science in Sports and Exercise in 2010 found that supplementation with creatine led to increased muscle mass and body weight in women, with no adverse health effects. 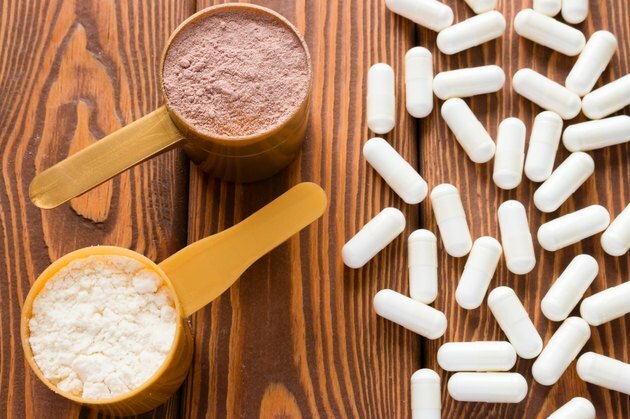 Creatine is present naturally in meat and fish, but to gain weight and boost muscle mass with extra creatine, you may want to consume the synthetic version found in supplements. To get the best results, combine it with a workout program, because creatine works by supplying additional energy to your muscles. According to MedlinePlus, creatine is likely safe when taken for a period of fewer than five years. However, taking creatine in high doses could possibly damage your heart, liver or kidneys. The supplement can also cause gastrointestinal symptoms such as diarrhea and nausea. Purchase creatine from a reputable source, because dietary supplements like creatine are not regulated by the Food and Drug Administration. Talk to your doctor before you start taking creatine or any other weight gain supplement. Dietary supplements can be expensive, so if you'd like to save a few bucks, you can gain weight by adding extra calories from food. Sports dietitian Nancy Clark recommends eating regular meals and snacks, increasing your portion sizes at meals, and consuming foods that are high in healthy fats and dense in calories. Add avocado to your salads; spread peanut butter on fruit or some crackers; add extra olive oil or coconut oil to your cooking or to a smoothie. If you want to gain muscle rather than fat, stick to eating healthy high-calorie foods, like nuts, dried fruit, granola and yogurt, rather than slamming down cheeseburgers and milkshakes.